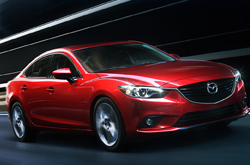 Mazda's flagship sedan, the Mazda6, returns for 2015 with a few new upgrades and features throughout its model roster. Fresh standards have been added to the Touring trim and a new options package is available as well. 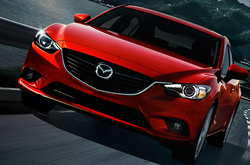 Additional technologies have also been added to all models, boosting the appeal of the updated 2015 Mazda6. Aside from these components, the sedan continues to offer great fuel economy, excellent performance and top-notch handling that can't be beat. If you want to know more about the latest Mazda6 and all of its highlights, check out our 2015 Mazda6 review below. Outfitted with a 2.5L four-cylinder engine, generating 184 horsepower and 185 lb.-ft. of torque, the 2015 Mazda6 in Houston delivers incredible performance. Both Sport and Touring models can come equipped with either a six-speed manual or six-speed automatic transmission, while the Grand Touring is available solely with the automatic. When outfitted with the optional i-Eloop feature, the Grand Touring produces an EPA-estimated 32 mpg combined, 28 mpg city and 40 mpg highway. On all other models, the automatic outputs an EPA-estimated 30 mpg combined, while the manual delivers 29 mpg combined - each fantastic numbers for a sedan in its class. Freshly updated for 2015, the Mazda6 comes equipped with one-touch power windows on each model. The Touring trim also gains standard keyless ignition and entry, along with a new options package. Available on all Touring models with an automatic transmission, the package comes with a sunroof, satellite radio and an 11-speaker Bose sound system. In addition to this, a Touring Technology Package is offered on the model, which features navigation, automatic headlights, auto-dimming rearview mirror/driver-side mirrors, heated side mirrors, rain-sensing wipers and a frontal collision mitigation system. For more info about the latest model, continue reading our 2015 Mazda6 review for engine specs and other details. 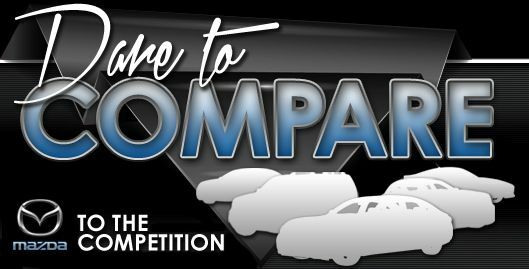 When you compare Mazda's most current Mazda6 model head-to-head with the 2015 Honda Accord, Toyota Camry, Nissan Altima and the Ford Fusion, you'll find out that it scores higher than the competition. With progressive incar technologies and an tasteful design, shoppers will love the Mazda6. Hundreds of Houston Mazda drivers choose it because it's a phenomenal value; just compare its price to the vehicles in its class. Catch a glimpse of our Quick List below to find out more! 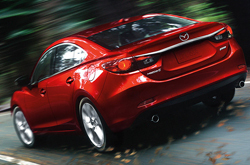 Thanks for choosing Joe Myers Mazda as your resource for 2015 Mazda6 reviews and comparisons. We are a prominent Mazda retailer in Houston, and it's our mission to serve you with reviews authored by some of the most skillful automotive writers in the industry. Everything perspective car buyers need to make good decisions is right here, including info regarding safety technologies and other specs. Each section is jammed with worthwhile data and specs - all at your fingertips. Now that you've read Joe Myers Mazda's review of the 2015 Mazda6, please reach out to us to find out about incentives and great short-term lease offers, so you can save significantly on your next purchase!